I don’t know what sparked the recent surge in interest over the spacing rules between sentences, but there it is: we are asking ourselves once again which is correct, one space or two? My wife came home just the other day to inform me that the two-space rule is deservedly dead. 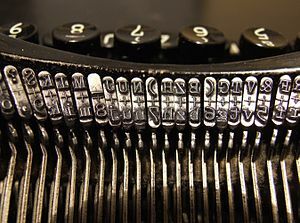 A lot of the old “purists” will talk about how the rule is rooted in the typewriter days, and they’re right, but what I didn’t know was why: In the early days of the typewriter, the keys could only move to stamp their letters if the keys were all the same width, so the fonts on those typewriter keys were designed with a uniform width in mind. The m, for instance, was the same width as the n, despite the extra hump. (Courier still mimics this on the computer.) And because all those letters used the same space on the page — even the period — an extra space between sentences became essential for reading ease. 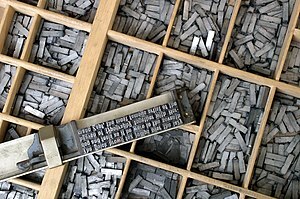 But our word processors today aren’t based on typewriters, they’re based on printing presses, and even from the days of Gutenberg, typeset printing used fonts with variable-width letters . . . and spaces. The variable widths of the letters (think “em dash” and “en dash,” for example) made for easier reading, but more importantly, the custom width of the spacers meant that the typesetter only needed to use one “sentence-ending” die for the space between sentences, as opposed to two of the smaller dies that marked spaces between characters. Our word processors’ digital fonts follow the typesetting rules, so the spaces our computer uses will (in theory) vary. It’s not perfect, of course, because our computers aren’t yet as smart as we are. Try typing “the Nov. elections” into MS Word and watch Word automatically capitalize “elections” like the beginning of a sentence. Our software doesn’t recognize the difference between abbreviations and periods, which means it doesn’t necessarily use a wider space between sentences, and to be honest, I still sometimes feel irked when I see a poorly written sentence with a lot of abbreviations in awkward places because I can’t always tell where one sentence ends and another begins. “Dr. Sam is a cranky old codger. Ms. Jennifer is very patient to put up with Dr. Sam’s curmudgeonly ways.” But in long texts with a wisely selected font and good sentence structure, I really can’t tell much difference. Look back at the test I ran while writing this, the one in which I swapped spacing on a 34-page story. I said there was no difference in length. As recently as a few days ago, I would have argued that this was evidence that the single-space rule doesn’t waste paper. But now I realize the other truth: two spaces doesn’t really increase the gap between sentences, either. If it did, that document (which contains something like 460 sentences) would become significantly longer with two spaces than with one. It doesn’t change at all. That means the computer is compensating somehow, adjusting my spacing according to logic that is based on variable-width typesetting rules. Back when I was teaching technical communication, I tried very hard to drill underlining out of my students’ habits. There are good document-design reasons for doing this (the underline creates a distraction for the eye so the eye follows it instead of the word, and we risk losing meaning), but the thing that often did the trick was when I started explaining how underlining entered our bag of tricks in the first place. Again, it’s related to typesetting and typewriters. Back in the early typesetting days, when manuscripts were still handwritten but printing was done by machine, authors discovered the option of using italic type but had no way to indicate it in their handwriting. Go ahead — try to handwrite a sentence in script and then handwrite the same sentence in italics. Maybe it’s a little slantier, but could you keep up the distinction over a whole manuscript? Could a typesetter tell the difference? To make this distinction clearer, authors took to underlining the words they wanted italicized. 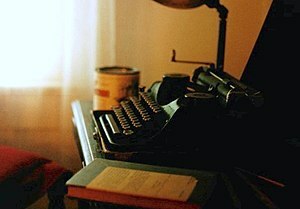 When typewriters came along, their work looked like “printed” text, but the limitations of cramming all those keys into a desktop machine meant no typewriter could include a completely separate set of italicized keys. It could, however, house the single-key underline stroke, and so what was a handwriting convention carried over to typewriting. But the function remained the same: typewritten underlined words still indicated to publishers that the author wanted italicized text. Enter the word processor, which — as a “desktop publisher” — allows us to set our own type. We can skip the unnecessary middleman that is underlining and enter our own italics. The underline, then, has become obsolete. And for those same reasons, I would argue, the double space between sentences is obsolete, too. So I’m letting it go, kissing it good-bye (or is that goodbye? oh, I feel another post looming . . .). I enjoyed you while I used you, double-space-between-sentences, but it’s time we went our separate ways. Someone told me a few years back to ditch the double space. I embraced it right away. I’d had problems not fully connecting the second space when I was typing fast, so I’d have to go back while editing and keep an eye open for my single space mistakes. Single space has become second nature. Double space just feels weird now, and glows from page–like there’s some sort of hole in the words that needs to be filled. You are concerned about space and yet you leave this nice wide gap between your paragraphs. Why? To clearly delineate the next step in your essay. So why not spaces at the end of your sentences to clearly distinguish between the flow of your thoughts within the paragraphs? Complaints about excess space and page counts seem kind of hollow when you contemplate those extra gaps just sitting there between paragraphs. An interesting point, Fred! For the record, though, I dislike the gap between paragraphs and much prefer the smaller white space provided by the paragraph-opening indentation, which is far easier on the eyes on a printed page. On the other hand, research has shown that in digital media, left-justified paragraphs with a bit of white space between paragraphs are easier to read. And really, when we boil all these typographical and formatting arguments down to their essential purposes, the whole point is to make reading easier. So I allow WordPress to automatically include those extra spaces between my paragraphs for the same reason I am trying to remove the extra spaces between sentences, and for the same reason I use a sans serif font on the computer, the reason I use dark text on a light(ish) background, and all the other dozens of little half-conscious decisions I make when I write and format these posts: not because it saves space, or even because it’s “correct,” but because it makes it easier for you to read and comment.